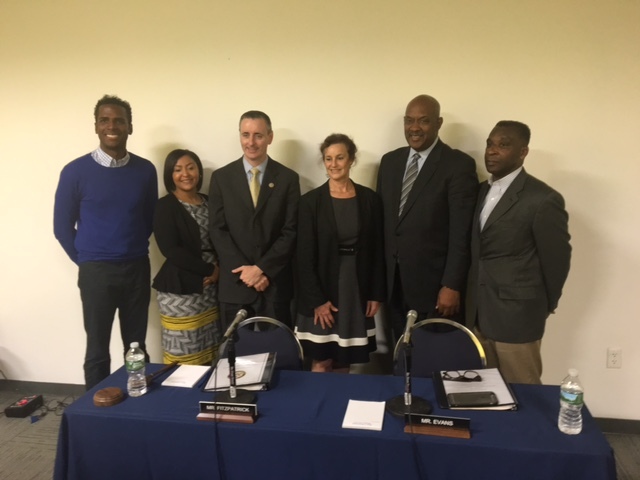 On Friday, October 20 the Enterprise Center in Philadelphia hosted a hearing titled "Small Business Capital Access: Supporting Community and Economic Development." The hearing was held before two representatives of the House Small Business Committee: Rep. Brian Fitzpatrick (PA-08), and Rep. Dwight Evans (PA-2). OFN Vice President of Public Policy, Dafina Williams, presented testimony on behalf of OFN as a local constituent of Rep. Evans (PA-2). In her remarks, Dafina provided an overview of the challenges facing small businesses in access credit, and how CDFIs are helping address those challenges. She shared key factors at play: "Small businesses are an important driver of economic growth but face macroeconomic and microeconomic challenges when attempting to access credit. Some of these challenges include: contractions in the banking system and lending to small business; a decline in the availability of small dollar loans; weak or limited credit history; lack of business and financial management skills, access to entrepreneurial training and networks, and limited awareness of lending options. These barriers are particularly high for entrepreneurs who are low- to moderate-income; women; racial or ethnic minorities; and otherwise traditionally disadvantaged populations." Dafina also spoke to the important role CDFIs play in small business lending, "CDFIs lend successfully in distressed markets and communities of persistent poverty by taking a localized approach to lending, adjusting their strategies and products to meet the needs of their communities, and by being accountable to the communities they serve." You can read Dafina's full testimony here. Another local constituent of Evans is Leslie Benoliel, president Entrepreneur Work, who also delivered a testimony. During her remarks, she noted the important role small businesses play in their local economies, "Small businesses tend to keep the money they make circulating locally. In the Sustainable Business Network’s Taking Care of Business report, it was found that money spent at a small business in Philadelphia is 71 percent more likely to stay in the community versus money spent at a national chain." The committee members also heard from local businesses owners. The full witness list and testimonies are available on the House Small Business Committee site.